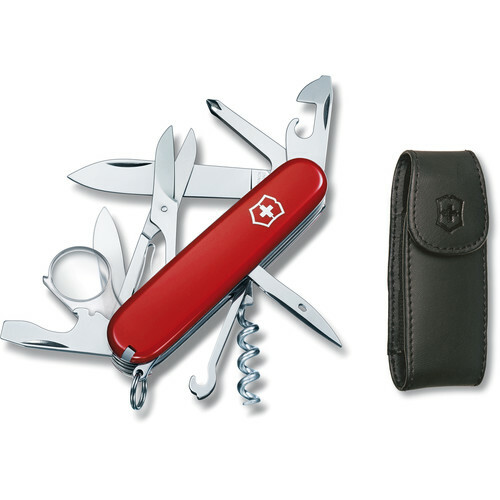 Designed for the everyday adventurer, the Explorer Pocket Knife is a versatile 16-function multi-tool from Victorinox. The core stainless steel construction is paired with polished red cellidor plastic scales which display the Victorinox logo. The knife features a large and small straight blade and handy tools such as a magnifying lens, Phillips screwdriver, and multi-purpose hook. This model also comes with a black pouch for easy carrying. Box Dimensions (LxWxH) 5.9 x 2.55 x 1.65"
Explorer Pocket Knife with Pouch (Red) is rated 5.0 out of 5 by 1. Rated 5 out of 5 by Momster from Son loved his birthday KS pocket Knife This is a really handy knife with tons of functionality. Bought it for son's 12th birthday so that he has various tools for when he is hiking, camping, whittling, etc. Loves it and BHPhoto had the absolutely best price... bought one for older sister to bring to college as well. Highly recommend.